CD41 presents a CD anthology of comedy and music from the celebrated 1930s/1940s British radio show, together with several vintage wartime recordings by resident comedian Arthur Askey. Band Waggon ran on the BBC between 1938 and 1940 made stars of both Arthur 'Big' Askey and Richard 'Stinker' Murdoch. Attracting almost 20 million listeners at its peak, the program also spawned a hit stage show, a film, and a host of deathless catchphrases including "aythangyow", "what would you do, chums? ", "doesn't it make you want to spit", "don't be filthy" and "light the blue touchpaper and stand well clear". This digitally remastered CD includes the very last Band Waggon studio show from December 1939, as well as favourites such as Chestnut Corner and The Proposal. Also featured are several of Arthur's trademark "silly little songs" including the evergreen Bee Song, and several topical comedy numbers cut during the Second World War, including Adolf (for which Askey was placed on a Gestapo arrest list) and Thanks for Dropping In Mr Hess, issued after the surprise arrival of Rudolf Hess in May 1941 - and immediately withdrawn by order of the government. The CD (and digital download) contains 21 tracks and runs for 72 minutes. The CD booklet features vintage photos and illustrations, as well as a detailed history of the Band Waggon show. A must for all nostalgia, variety and comedy buffs!. Tracklist: Band Waggon - final broadcast, December 1939); Chestnut Corner; The Proposal; Big & Stinker's Parkour Games; Moment Musical; Arthur Askey songs - The Bee Song, It's A Hap-Hap-Happy Day; Adolf; The Washing on the Siegfried Line; What A Nice Lot of Nazis; I Wanna Banana; Get In Your Shelter; The Thing-Ummy-Bob; Kiss Me Goodnight Sergeant Major; Thanks For Dropping In Mr Hess; When That Man Is Dead & Gone. Born in Liverpool on 6 June 1900, the diminutive Arthur Bowden Askey sang for wounded soldiers as a child in the Great War, and in 1918 spent six short months in the Welch Regiment in 1918. A humble clerk in peacetime, Askey formed his own amateur concert party group, and made his professional debut in 1924 as principle comedian with the Song Salad Party. He was first heard on radio in 1933, and appeared in his first film three years later. His radio reputation was boosted in May 1937, when he replaced Max Miller as co-presenter (with George Robey) of a BBC special to celebrate the coronation of King George VI. Irritated by Robey's appropriation of the best lines in rehearsal, Askey ad-libbed during the actual broadcast, earning official censure, but unofficial glory. That same year the BBC Audience Research department discovered that dance band shows were not as popular as had previously been thought. Since the Corporation was planning to produce a new series of such programmes, based on an American format called Band Waggon, it was decided to broaden their scope by adding both a compere and a resident comedian. Producers Harry Pepper and Gordon Crier tossed a coin to decide on the latter: heads for Tommy Trinder, tails for Arthur Askey. The coin came down heads, but since Trinder was unavailable the lesser known Askey got the job, due in large part to his spontaneity on The Coronation Revue. He was teamed with suave straight-man Richard Murdoch (1907-1990), an actor and light comedian educated at Charterhouse and Cambridge, then working in review. Band Waggon debuted on 5 January 1938, and was the first BBC variety show to go out in a fixed weekly slot with a fixed cast. As well as dance band The Bandwaggoners, organist Charles Smart and veteran comedian Syd Walker, the show also featured slots such as What Do You Think? and New Voices, a kind of Opportunity Knocks. After the first three shows were poorly received the script writer was dismissed, and Askey, Murdoch, Crier and Vernon Harris took charge themselves. The new format cast 'Big Hearted' Arthur and 'Stinker' Murdoch as supposed caretakers of the Greenwich time-pips, living in a fictional flat on top of Broadcasting House together with a goat named Lewis, and pigeons Basil and Lucy. Thus Band Waggon can lay claim to being the first British situation comedy. Askey and Murdoch's anarchic comic spots came to dominate Band Waggon, and the show was soon a huge hit. Other regular characters included Mrs Bagwash, a charwoman, and her daughter Nausea, although neither was ever actually heard. Nausea always fainted in front of the microphone and of her listeners heard only a thud. In fact Big Hearted Arthur was courting Nausea, but never seemed to get anywhere, for in 1938 the BBC had a strict code of conduct on such matters. Many episodes ended in physical disaster, in which the energetic Askey triggered the famous Band Waggon crash - in fact a large pile of assorted metal objects in a corner of the stage. Band Waggon was also the first British show to employ catchphrases successfully. These included "Hello playmates", "What would you do, chums? ", "Ah happy days", "doesn't it make you want to spit", "don't be filthy", "light the blue touchpaper and retire immediately" and "aythangyow" - the latter pronunciation picked up by Arthur from London bus conductors. Another popular feature was Chestnut Corner, in which Askey and Murdoch exumed ancient jokes for one last airing. 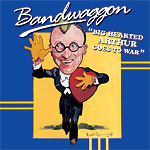 "Big Hearted Arthur" also performed his trademark "silly little songs", including the immortal Bee Song. This would be his first record release after signing a contract with HMV, and was recorded in April 1938, just as the first series of Band Waggon ended. Band Waggon aired for two series, the first running to 18 shows (5 January to 4 April 1938) and the second for 24 (5 October to 15 March 1939). At its peak it was estimated that some 20 million people tuned in on Saturday evenings. Such was the popularity of the show that canny bandleader Jack Hylton snapped up the stage rights, which opened - rather too hastily - at the Princes Theatre (later the Shaftesbury) on 26 December 1938. It flopped, but proved a runaway success at the Gaumont in Holloway, where it re-opened in January 1939, and was soon filling the 3000 seat theatre three times a day. A national tour followed, taking in Birmingham, Glasgow, Edinburgh, Manchester, Coventry and Liverpool, before finally returning to the London Palladium on 3 July 1939, with guest comedian Tommy Trinder joining in the fun. Askey later commented that Band Waggon was the first show of its kind on British radio to steer clear of eccentric characters: "I was myself and Dickie was himself, and millions of listeners believed in us and our flat." Indeed to such an extent that each week listeners sent in hundreds of letters addressed to the fictional flat above Broadcasting House. A third series of Band Waggon began to air on 16 September 1939. Even Parliament noted its reappearance, with Sir John Simon welcoming this return to normality, and Sir Samuel Hoare commending the programme as a national pick-me-up. By now Britain was at war with Germany, and Askey announced the first programme thus: "Well, playmatesÖ I think it's a stroke of genius putting Band Waggon on the air. It'll make old Nasty realise what the British public will put up with. Anyway, they had to do something to give the gramophone a restÖ Old Stuart Hibberd's nearly worn out winding it up - and, of course, you probably notice how muffled it sounded for a few days. Well, they investigated and found there was a pair of Grisewood's socks pushed down the horn. They'd been there since the Savoy Hill days when the neighbours used to complain about the noise." By now the BBC had moved west to Bristol. Although this first show made several references to the national emergency (charwoman Mrs Bagwash was now 'somewhere in Essex" on work of international importance, while her daughter Nausea was a barrage balloon "blower-upper" in Hyde Park, and Lewis the goat had been snatched by an ARP Decontamination Squad), later editions contained noticeably fewer references to the war. The last original radio episode of Band Waggon was broadcast on 2 December 1939, after which the show was replaced by Garrison Theatre, starring Jack Warner. Quite why Band Waggon was not revived for a fourth series remains a minor mystery. The most likely explanation is that the runaway success of the show on stage, screen and radio left Askey and Murdoch without sufficient time to write quality new material, and certainly the inferior script for the Band Waggon film released in January 1940 bears this out. However it would also seem that Askey was poorly advised, and pursued short-term financial gain over the longevity achieved by Tommy Handley, Kenneth Horne and others. It hardly helped that war broke out, as Askey later recalled in his autobiography: "Everything was going my way and the only cloud on the horizon was another comedian called Adolf Hitler, who I had an uneasy feeling was going to spoil things for me and everybody elseÖ After fifteen years years' struggle to get my name in lights, came the black-out! To say I was depressed is to put it mildly." Directed by Marcel Varnel, with a script by Marriot Edgar and Val Guest, the Band Waggon film began shooting in August 1939. The plot saw Big, Stinker and Lewis the goat evicted from the flat above Broadcasting House, and obliged to move into ghostly Droon Castle, where they discover a haul of advanced television equipment. The pair decide to broadcast their own pirate show, little knowing that the kit belongs to a nest of Nazi (or are they Russian?) spies. Jack Hylton and his Band also featured heavily, but the film had little in common with the earlier radio series, and was coolly received. In March 1940 Askey and Murdoch recorded a Band Waggon derived sketch, The Proposal, for release on HMV, the proposal in question addressed to Nausea. It proved a best-seller. Then at the end of April the pair (plus Hylton) flew to France to entertain the troops, and only narrowly avoided the Blitzkrieg unleashed in May. Askey's silly little songs had already taken on a more topical hue. He was the first to record The Washing on the Siegfried Line, for which he was placed on a Nazi arrest list, and followed this with Adolf, Kiss Me Goodnight Sergeant Major, Run Rabbit Run, I Wanna Banana and others. In 1941 his comic song Thanks for Dropping In Mr Hess was hurriedly withdrawn by order of the government. A further stage variant of Band Waggon played the summer season at Blackpool Opera House in 1940, and was broadcast on radio on 8 June, but soon afterwards Murdoch joined the Royal Air Force and the Band Waggon finally ground to a halt. While serving in the RAF Murdoch met Kenneth Horne, the pair teaming up for two further vintage BBC radio comedies, Ack-Ack-Beer-Beer (1939-1944) and Much-Binding in the Marsh (1947-1953). A final Band Waggon was broadcast on 13 November 1947, as part of the BBC's Silver Jubilee celebrations, and a decade later Askey and Murdoch adapted the format for television. However Living It Up was not a conspicuous success, and ran for just nine episodes in 1957, despite the relocation of Big and Stinker's celebrated flat from Broadcasting House to the Associated Rediffusion building on Kingsway. Askey's initial film career lasted from 1940 to 1944, ending with the commercial failure of Bees in Paradise. Over the next three decades, however, he endured as a major figure on radio, television, variety and panto. Arthur Askey died on 16 November 1982.